Green infrastructure installations include distributed stormwater management infrastructure (e.g. 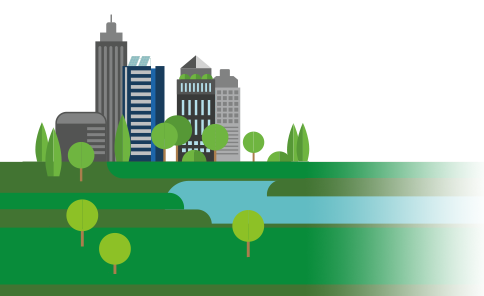 green roofs, rain gardens, bioswales, and tree-lined streets), as well as the greenways, parks, urban farms, and protected river basins that weave through a city’s environment. There are many ecosystem benefits associated with healthy and extensive urban green infrastructure -e.g. reduced stormwater flows, improved water quality, carbon sequestration, reduced urban heat island effects, biodiversity. Studies also indicate that green urban areas can improve property values and have multiple social, economic, health, and psychological benefits. However, there are green infrastructure synergies and trade-offs that are not yet well understood. For example, investments in green infrastructure may provide livability and resilience benefits in a neighborhood, contributing to economic renewal and beautification, but they may also drive processes of gentrification and give rise to related social justice concerns. Developing science-based methods for understanding the interactions at play between green infrastructure co-benefit and tradeoffs is a core part of the network’s research efforts in this area. Additionally, greater social and technical understanding of how best to design, steward, and govern distributed green infrastructures is critically important for being able to successfully leverage green infrastructure systems in support of environment, health, and wellbeing outcomes.